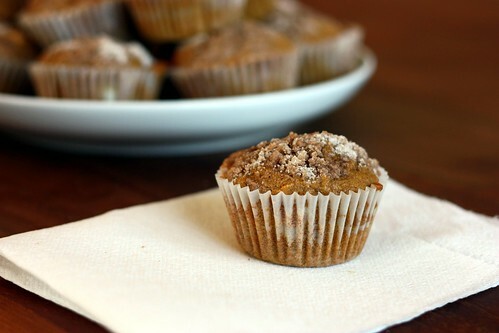 Pumpkin Cream Cheese Muffins – Elly Says Opa! 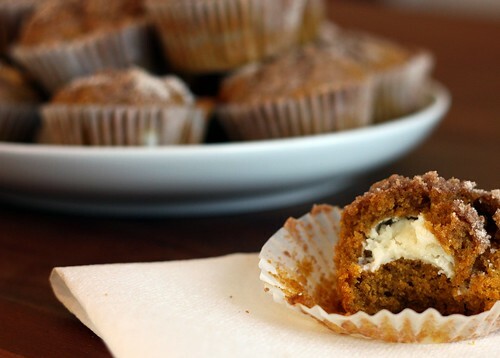 These pumpkin cream cheese muffins are delicious. They’re like eating pumpkin cake with built-in cream cheese frosting, but since they’re called “muffins” you’re allowed to eat them for breakfast. These muffins are a copycat version of the ones Starbucks carries. I’ll be honest and say that I’ve never had a pumpkin cream cheese muffin from Starbucks, but I feel pretty confident that these would surpass them in my book. Here’s why: sweetened cream cheese. I’m weird when it comes to cream cheese. Cream cheese is great. It is, in fact, one of the greatest foods. However, plain cream cheese must be paired with savory food and sweetened cream cheese must be paired with sweeter items. There’s no getting around this. If you don’t believe me, ask my poor husband who came home with a cinnamon raisin bagel with plain cream cheese for me one day. A no go. In order for cream cheese to be on a bagel, it must be a savory bagel (think sesame, everything, or onion). This is largely why I’ve avoided this particular Starbucks muffin. But then I saw Annie’s version, where she sweetened the cream cheese (smart girl, that Annie), and all was right in the world. I also added a little vanilla to make it even more cream cheese frosting-y. This made more than 24 muffins for me. I had enough batter for an extra 5 muffins, but I had already doled out the cream cheese, so I just baked those on their own. I ended up giving some away and also freezing some of these for fear I would eat 5 per day until they disappeared. I altered the recipe slightly to accommodate for two things I don’t stock in my kitchen – vegetable oil and pumpkin pie spice. If you have pumpkin pie spice, you can go back to the original version for the amount. To make the filling, mix together the cream cheese, sugar, and vanilla extract until combined. Shape the mixture into a log (about 1.5″ in diameter), with the aid of plastic wrap, and wrap the log tightly. Reinforce with tin foil or place in a plastic freezer bag and freeze for 2 hours or longer, until firm. To make the muffins, preheat the oven to 350 and line muffin tins with paper liners. In a bowl, whisk together the flour, spices, salt, and baking soda. In the bowl of an electric mixer (or a large bowl), mix together the eggs, sugar, pumpkin puree, and oil on medium-low speed, until blended. On low speed, slowly add the dry ingredients. Use a spatula to do any last incorporating of wet and dry ingredients. To make the topping, whisk together the sugar, flour and cinnamon in a small bowl. Add in the butter pieces and cut into the dry ingredients with a pastry blender or two forks until the mixture is coarse and crumbly. Transfer to the refrigerator until ready to use. To assemble the muffins, fill each muffin well with a small amount of batter, just enough to cover the bottom of the liner. Slice the log of cream cheese filling into 24 equal pieces. Place a slice of the cream cheese mixture into each muffin well. Divide the remaining batter among the muffins, placing on top of the cream cheese to cover completely. Sprinkle each muffin with a small amount of the topping mixture. Bake for 20-25 minutes. Transfer to a wire rack and cool completely.